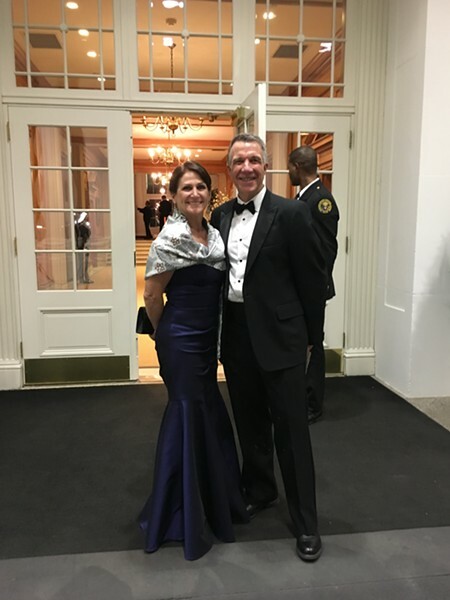 “He was cordial to everyone,” Scott said of President Donald Trump, who hosted the nation’s governors at a state dinner. Like the other governors and their spouses, Scott and his wife, Diana, were introduced to the president and first lady Melania Trump. She was making a rare White House appearance for the event. But Scott did hear Trump talk twice — once at the Sunday night dinner and again at a Monday morning White House meeting. Scott described hearing a sampling of Trump’s characteristic tone but also an attempt by the president to ramp down some of his well-known rhetoric, at least on immigration. Over the course of four days of meetings with Trump, Vice President Mike Pence and administration officials, Scott said, the message was that the president is focused on deporting immigrants who commit crimes rather than those who are violating only immigration law. In Vermont, Trump’s executive order on immigration prompted Scott and legislative leaders to launch efforts to insulate the state from aiding the president. Trump’s orders also incited fear among undocumented workers on Vermont farms that he’s out to deport them. Neither Trump nor anyone on his staff mentioned such an effort, Scott said. Scott said the president is expected to come out with a new executive order on immigration. What that might say, Trump and his staff did not reveal, the governor said. The president didn’t seem to give governors a clear idea what he plans to do with the Affordable Care Act or other government programs he’s threatened to cut. Nonetheless, Scott came away from the meetings with the impression that Trump’s administration will listen to the nation’s governors. It should help that Pence is a former Indiana governor, he said. This was the governor’s first trip to the White House. He wore a tux and said he was “in awe” of the historic significance of his surroundings. But the race car-driver-turned-governor had to skip watching Sunday’s Daytona 500 for the day’s NGA events. “I missed the great American race,” he said.